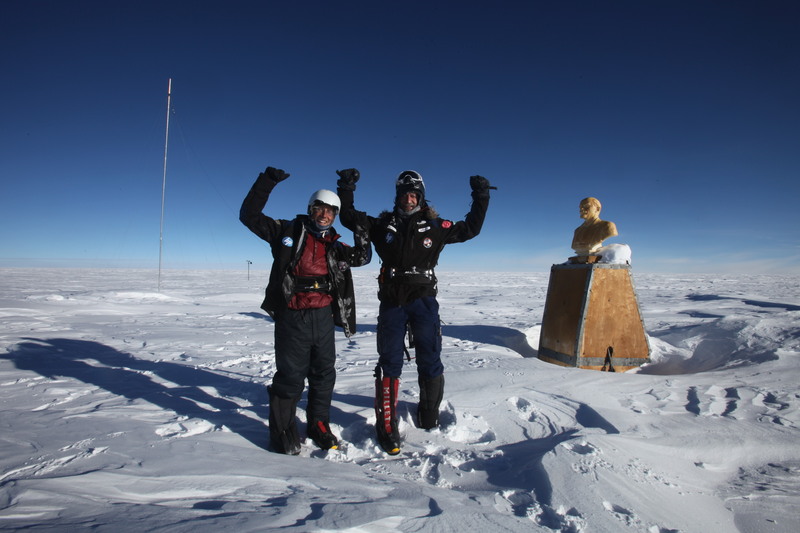 Sebastian and Eric at the Antarctica Pole of Inaccessibility on their way to complete the first crossing of the continent from east to west with nothing but skis and kites (note the bust of Lenin in the b/g!). Sebastian and Eric are shortlisted for Epic TV’s Adventurer of the Year award 2012 for their epic 4000 kilometers, 81 day kite-skiing expedition in Antarctica. The trip netted the team three new polar records, among which the first transcontinental crossing linking the east coast to the west coast via the Pole of Inaccessibility and the South Pole, one hundred years after the conquest of the pole. All this with nothing but human and wind generated energy. Epic TV and adventure magazines across the globe shortlisted twelve teams. The rest was left to voters: one vote per day for one month. May the best, err, marketer win…?